I just got back from a conference where professional scientists present “poster sessions”. For a scientist, presenting a poster is a grown-up science fair, except there is no judging or best of show. You do, however, have to hang around your project and answer questions. Most reports are done as giant posters (up to 4 x 4 feet) that hang in a giant conference hall. The posters contain the usual science-fair kind of information: Background, Method, Data, Graphs, Conclusion. This particular conference was the American Astronomical Society’s 207th meeting, held in Washington, DC (the venue moves each time). The reason I was there was to share how my research project using the Spitzer Infrared Space Telescope turned out. I’ve been working on it very hard for a long time, and that’s one of the reasons my output at Low End Mac has slowed lately. When the time came for me to make my poster, I had several programs from which to choose. Ostensibly you make a poster, turn it into a PDF, and then get it printed somewhere. I evaluated Fathom, a data analysis program used to make mathematical models; Graphical Analysis 3 from Vernier Software; CMap Tools, a free flowcharting program; and OmniGraffle, a trialware program included on new Macs and available for downloading. While the other programs had their pluses and minuses, I eventually left them to use OmniGraffle because of the visual appearance of the elements. Fathom and Graphical Analysis 3 do not give the user full control over the appearance of the document, especially inserted graphics. CMap Tools, while a powerful flowcharting program and available for free download, was not versatile enough to handle all the types of document parts I needed. I settled on OmniGraffle as a sort of last resort and was pleasantly surprised to see it not only do flowcharts, but graphics as well. It can use the flowcharting objects as containers for text, so I wrote the paper in Microsoft Word, then copied and pasted it into OmniGraffle. It’s more like page layout software for desktop publishing than it is a word processor. The results of my work can be seen on our Spitzer project page. 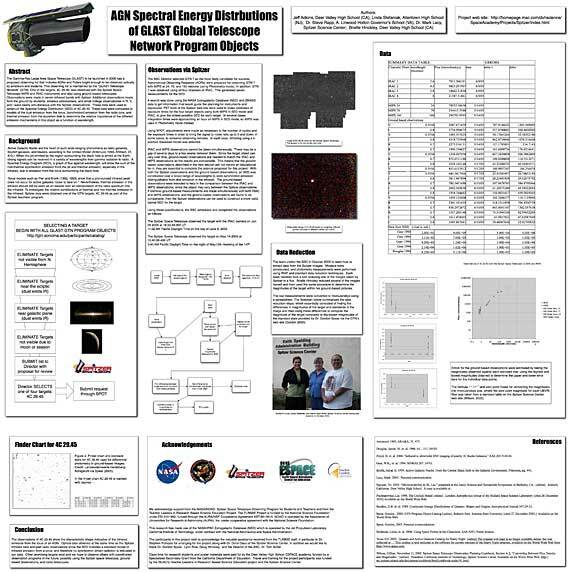 Go to AstronomyTeacher.com, click Spitzer Projectlink590, and that will lead you to the project home page, where you can download the final versions of the posters I and my fellow teachers, Linda Stefaniak and Steve Rapp, presented. OmniGraffle has several nice features for this kind of work, including drop shadows with fine tuning controls for the text boxes. That means you can direct the shadows in any direction you like. It also can render a photo semitransparent for use as a background picture. The usual arrows and shapes any flowcharting program uses are there, of course. You can set the page size to 4 x 4 feet in the page setup dialog, and OmniGraffle handled it without skipping a beat. I used the rectangle tool to make boxes for each segment of the report, dumped the text in, and then worked on formatting. The snap-to guides are really handy for aligning things. The responsiveness reminded me of Keynote’s ability to generate alignment marks on the fly while you move things around. On the negative side, OmniGraffle doesn’t handle tables well. After wrestling with the table layout of a simple table for half an hour, I finally gave up and pasted the data table in as a high resolution graphic. Perhaps the latest version is better. It looks like there are some primitive table functions built in, but nothing even as sophisticated as, say, AppleWorks. All of my science students will be making posters for the science fair this year using the techniques I learned using OmniGraffle. We’re done the glue-it-on-cardboard variety, and we’ve now done giant integrated, computer printed posters. The computer posters look a lot better. Once I arrived at the conference, I noted that quite a few of the posters seemed to be made up in PowerPoint, and indeed they were. It was probably the most popular medium for creating posters at the conference. If only all the backgrounds didn’t look the same…. Anyway, I paid for the upgrade from the free version of OmniGraffle on my laptop, and I’m not sorry I did it. We need to support these folks so they will continue to produce useful software like OmniGraffle. Oh yeah, it does flowcharts, too.